Venezuelan opposition supporters hold a rally in support of Caracas mayor Antonio Ledezma on February 20, 2015. America is playing hard ball against Venezuela. The White House announced sanctions against seven prominent Venezuelan officials Monday in response to the South American government's increasingly violent actions. These Venezuelan military and intelligence officials are banned from visiting the U.S., and their American assets -- bank accounts, mortgages -- are now frozen. A Treasury Department official would not confirm if any of the officials had assets in the U.S., but said there was a 10-day time period to report them to the Treasury. American businesses, of which there are many in Venezuela, can't talk to the sanctioned officials either. The White House accuses these seven Venezuelans of human rights violations. One of them is Gustavo Enrique González López, the director of Venezuela's national intelligence agency, SEBIN. According to reports, Venezuelan police have killed or injured dozens of protesters in the past two years. The country is suffering from the highest inflation in the world, and some dub it the world's worst economy. At the same time, Venezuela's President Nicolas Maduro has arrested and imprisoned his critics, such as opposition leader as Leopoldo Lopez, after Maduro narrowly won re-election in 2013. 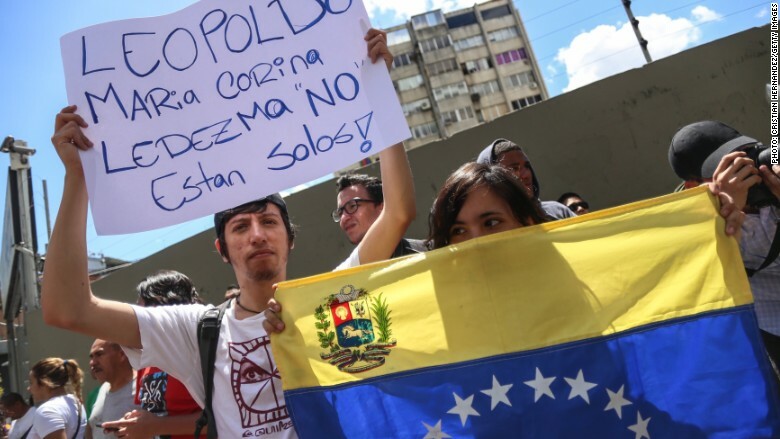 President Obama's power play against Maduro comes only weeks after Maduro arrested the mayor of Caracas, Antonio Ledezma, accusing him and the U.S. of attempting to overthrow him. If inflation and political unrest weren't bad enough, Venezuela is suffering mightily from the falling price of oil, its main export. The South American country needs oil to trade well over $100 a barrel in global markets for the government to balance its budget. At the moment, it's trading around $50. Maduro visited several OPEC nations and China in January, asking for emergency funds to shore up his government. Some experts believe Venezuela has a high chance of defaulting on its debt in October when it owes about $5 billion to creditors. Obama's executive order Monday does not block imports of Venezuelan oil, but the U.S. has steadily lowered its reliance on the shaky trade partner. A decade ago, the U.S. imported about 568 million barrels of Venezuelan oil a year. Last year, America imported about half that -- 288 million barrels. The latest U.S. actions are backed by the Venezuela Defense of Human Rights and Civil Society Act, which Congress passed in December. It authorizes the president to pass these types of sanctions on Venezuelan officials. The Venezuela government did not immediately respond to request for comment. Editor's note: An earlier version of this story listed an incorrect figure for U.S. imports of Venezuelan oil.